The seat is painted, but I need to add the harness yet. After that I'll be ready to close up the fuselage and make some rapid progress. This is mostly OOTB except for the added O2 hose. Cheers! Its time to get this ball rolling :) all supplies on hand - I will likely do some painting experimenting along the way so might be a bit slow to start. Cockpit will be first up but forgot to include it in the pics below :( anyhow - just to show you I am ready here are some opening shots! This first pic shows the various prints - why so many you ask? The first is the standard card printout. The second is the metallic on Red River Silver. The third is just one page on glossy photo stock. This will be for the blue nose and nose cone only to maintain the shiny look of the metallic paper. The fourth is printed on standard 20lb paper and will be used for making pseudo decals on the metallic paper. These will be sprayed with Krylon gloss coat or something similar eventually. This also includes what I will be edge coloring with and a shot of the engine parts to show the expected detail level. closer shot of the engine parts. OK - The proof is in the pudding they say :) Here are some pics with some commentary. I cut out everything round with my paper drill - thank goodness for that! Next steps and other mods I will be doing following the pics! This is the radio box - please note there are TWO of them. This will be my first test. I am going to paint one after it glued and one before its glued to compare results. 1. cut out another instrument panel to overlay - I will cut out all the instruments so the ones behind look recessed. I will likely but some shiny scotch tape in there to simulate glass in front of the instruments. 4. possibly scratchbuild a small cushion for the pilots seat - I dont quite understand the seat how it has a rather large curve on the front like there shold be a cushion in there. There are more parts, more cutting, and more shaping in those paper models than in building anything in plastic! Impressive work, both in scope and technique! I assume you're talking about painting the edges. Well, there is the other alternative way. Don't paint them at all. Take a look at my picture with the coin in it. You can see the box as simple as your radio. Outside edges are cut at 45 degree angle. This method is kind of a shortcut ;) When you'll put the box together, the white edges will simply disappear. If you're using water-based glue, use minimum amount to eliminate deformation problem. Anyway, It's good to see you in action. Thanks Gil and Peter :) I catch enough flak from the family for cutting bits of paper let alone if I wore magnifiers! For cutting at a 45 degree angle I hadnt thought of that but its a good idea worth trying! While Chris is practicing his 45 degree cuts, ;) let me show you my P.11c pilot's seat. Thanks to my friends from Poland I have learned that the P.11c' seat was adapted to the back assembly parachute. So I have decided to make the upholstery based on what I have seen in the P.11c in the Krakow's museum. I have carved it from two pieces of cardboard glued together. The buttons are made of styrene rod inserted into the holes. The seat belts - I have made them more visually appealing by removing half of the card thickness from the strip and leaving the fasteners and the brackets in the original card thickness. The headrest - For convenient glueing I have removed half of the card thickness here as well, but only from the bottom of the part with the leaf-like sections (first picture). After assembling I touched up the complete part with paint, gave it a layer of mid density SG, polished it and sprayed a layer of the clear matt acrylic. Finally, I have put everything in the cockpit and covered the cage with its top part. Peter, your skills set in this paper medium is amazing. Adding paint to paper surfaces without causing wrinkles or warps or bubbles is a skill I would like to have. Keep up the great work. You are making my F-86F look primitive. I have it together now with the warps out and the surfaces straight. Thank you Ed and Chris! Adding paint to paper surfaces without causing wrinkles or warps or bubbles is a skill I would like to have. As I stated in my first post, I covered the pages of my kit with a thin layer of a Nitrate Dope. So, the surface of the card is not longer bare paper. ND protects the paper before the water-based paint perfectly. Edge coloring doesn't matter because there you use your paint only in small amounts. if you have to paint bare paper for some reason, use only a moderate amount of the paint and nearly no water for dilution. You can almost compare this method to a dry-brushing technique. If you're still afraid of deformation, don't paint all your surface at ones. Apply the paint to a small area, wait until it dries and go ahead again. The first layer will appear uneven but the second will be OK. And of course I'm talking about the old fashion brushing, not airbrushing. Also remember, I'm building this model in the standard manner where the paint is only allowed to color the edges and hide the model construction seams that are not present on the original airplane. So it's relay minimum painting we're talking about. Let me show you pictures of the cockpit equipped with some devices. I have decided to build this model using only the kit parts, yet I couldn't help it but build push rod for the Viet's starter from scratch (first small picture). After some serious debating with myself, I'll enter this group build too. Not sure how successful I'll be, but I'll try. My subject will be Ernst Udet's Albatros D.V using Wingnut Wings' 1/32 kit. (Yes Chris, its plastic). I may be slow at it, seeing as I'm trying to finish a GPM Sherman, ATF Dingo I and Scud Missile Launcher, all in paper. My painting skills are rusty, so here's hoping! GREG! PLASTIC! :) that will be a new sight for me :) looking forward to it! Hey peter that is an excellent cockpit and I really like how you made those pics to highlight the subject. My MkI Spit is painted! I did the Dark Earth on Friday evening. I decided to do a "tight feather-edge" mask for applying the Dark Green today. I used Sherwin Williams yellow tape (much like Tamiya tape, but much cheaper and in bigger rolls) and placed thread along the mask edges to raise those edges ever so slightly. This is TEDIOUS work, but it's VERY effective! Note that I've also post shaded both colors with lighter tones to add a bit of "character" to the camo. At this distance, the camo almost looks like a hard-edge mask. However, if you get within 6inches, you can clearly see the soft edges. By the way, I initially was going to use some blue-tac to do the camo, but had a devil of a time trying to put it on the model. It would stick to my fingers better than the model! Made it impossible to put into place! Is this because I was in my garage and it was rather hot (above 90deg)? Do any of you who use this method regularly have this problem, or did my environment create the problem? Thanks! Interests:Model aircraft, muscle cars and battleships. Also a BIG F-body nut (Firebird and Camaro), History major with area of study in Political Science. I'm married and have a young son. Wow, Gil has all of his airplane painted in camouflage, and I'm still sitting in the cockpit. It's time to hurry up. Now, about the compass. Instruction suggests rolling up a tight cylinder out of a rectangular piece of paper and then file one end of it into the shape of a hemisphere. You can make this easier by cutting the piece of paper the way I have shown in the picture below, and then roll it up. You'll end up with a hemisphere shape almost without filing. Your bag of tricks is amazing. What would happen if you lightly saturated the hemispherical end of the cylinder with a thin super glue? It would seem that when cured the glue would permit filing or sanding to shape easier and without paper burrs. A side benefit is that the tight roll of paper will never unwind. I ask this because I do not know the answer. I may be in the camo stage, but it looks like you have as many parts in your cockpit as I have in my entire model! Mind boggling craftsmanship! Thats awesome peter! One of the best cockpits I have seen! What weight paper did you roll that out of? 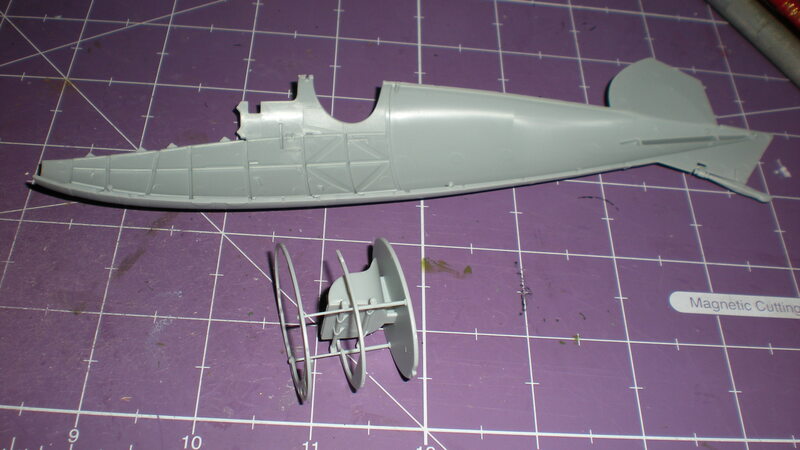 My build is on temp hold while I make a quick turkish fokker to hone my skill set a bit - I am rusty. It's good to hear from you guys. Thank you for mentioning the Super Glue. Saturating paper or cardstock with super glue prior to sending is natural to me, I forgot to mention that. I always keep super glue in three densities on my desk. I also use it for gluing, gap filling, and some part reinforcement. kind of like art for art's sake. paper. This paper is usually reserved for the parts intended to be rolled. good luck with practicing on Turkish Fokker. I'm keeping my fingers crossed. Come back soon.